OAK 311 has received this issue. Your service request ID is #853406. Please check back for status updates, or contact us directly at 510-615-5566. 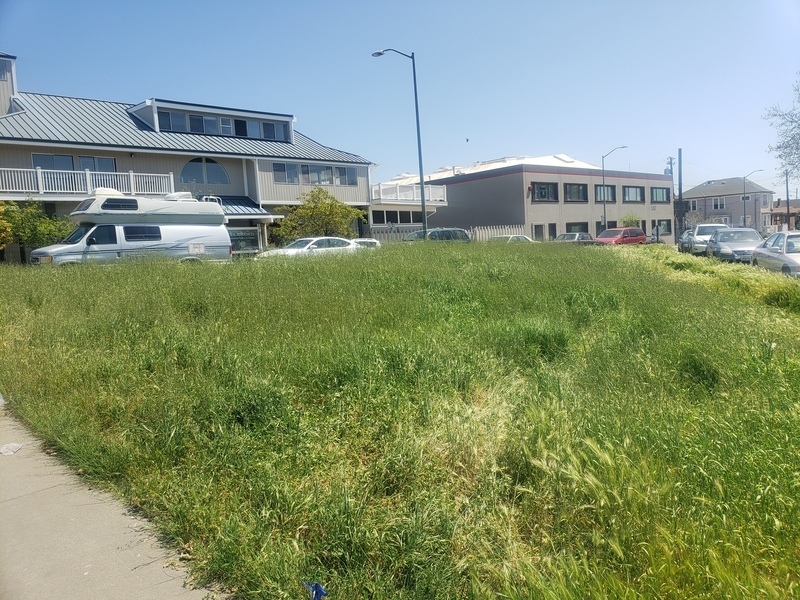 The City of Oakland addressed this issue on 04/25/2019, service request #853406. The bike and turn lane striping on Bay Place in front of Whole Foods is so faded as to be almost invisible causing cars to regularly drive in the bike lane and making this already very busy intersection more dangerous for bicyclists. OAK 311 has received this issue. Your service request ID is #898403. Please check back for status updates, or contact us directly at 510-615-5566. Thank you for your request. According to our system, we already have an open service request of this kind at this location. Your request has been combined with service request #898404. If you would like to check the status of the request, please contact OAK 311 at 510-615-5566 or OAK311@oaklandnet.com. This issue can also be followed by watching http://seeclickfix.com/issues/5747115. People not wearing safety harness while standing on the roof. OAK 311 has received this issue. Your service request ID is #899070. Please check back for status updates, or contact us directly at 510-615-5566. OAK 311 has received this issue. Your service request ID is #898670. Please check back for status updates, or contact us directly at 510-615-5566. If this is on the freeway itself, you need to contact Caltrans directly, and file a complaint with them. Neighbor has a barking dog continuously barking throughout the day and into the late night. Became an issue mid-March. We have tried to address withe the owner directly with no result. We have called the OPD and Animal Services to address the barking dog and they advised to make an official noise complaint. The barking dog is a nuisance and is left outside to bark all night long, disturbing the residents of the street. OAK 311 has received this issue. Your service request ID is #899115. Please check back for status updates, or contact us directly at 510-615-5566. Nuisance abatement 238-6370. If they are not busy OPD 777-3333 request for a welfare check as you are concerned about the residents well being. Officer Willie Wilkins Park aka Elmhurst Park. Needs more lighting at the park. Will reduce the amount of crimes happening recently. This will also reduce the places that criminals can hide. OAK 311 has received this issue. Your service request ID is #829226. Please check back for status updates, or contact us directly at 510-615-5566. The City of Oakland addressed this issue on 04/25/2019, service request #829226. OAK 311 has received this issue. Your service request ID is #899113. Please check back for status updates, or contact us directly at 510-615-5566. The bike lane along MacArthur approaching 55th is laughable. There is nothing stopping cars from entering as they speed along to pass others, or to get a shortcut to the stop sign onto 55th. It is extraordinarily dangerous for bicyclists. There needs to be some kind of physical barrier to stop cars, or some painting on the roadway (like on 40th St) to remind cars to share the road. It's crazy, especially considering there are never any traffic control officers/police vehicles nearby to catch scofflaws in the act. OAK 311 has received this issue. Your service request ID is #898832. Please check back for status updates, or contact us directly at 510-615-5566. I agree with the commenter. The city did not do this right. The sidewalks should have been repaved and widened and made into a combo walk/bike sidewalk. The current “fix” is a hazard and serves no one, least of all bikers who by the way never seem to use the lanes. I agree with this. Something must be done to stop cars from speeding down the bike lane. I also support the idea also of paved sidewalks and a barrier. I'd love to ride my bike to Mills Pool but don't care to risk getting killed. A high percentage of drivers to not respect the bike lane and use it to move ahead of the line. It is just a matter of time before a cyclist gets injured or killed. I think it would be a great enhancement to the neighborhood to make this route "bike-friendly". OAK 311 has received this issue. Your service request ID is #895514. Please check back for status updates, or contact us directly at 510-615-5566. The City of Oakland addressed this issue on 04/25/2019, service request #895514.